Veuve - Yellow Label - 750ml is rated 4.8 out of 5 by 20. Rated 5 out of 5 by jlou from Great gift We bought this for a Christmas gift for good friends. It’s my favorite but the two glass shown are not included. They have there own pretty glassware. It arrived on time. Rated 5 out of 5 by newfiejacq from Great Service! Champers delivered to my friends - they were delighted. Rated 5 out of 5 by LisaB from It was a gift....... I bought this for my son & daughter in law for their anniversary. I know they were appreciate & said it was great! 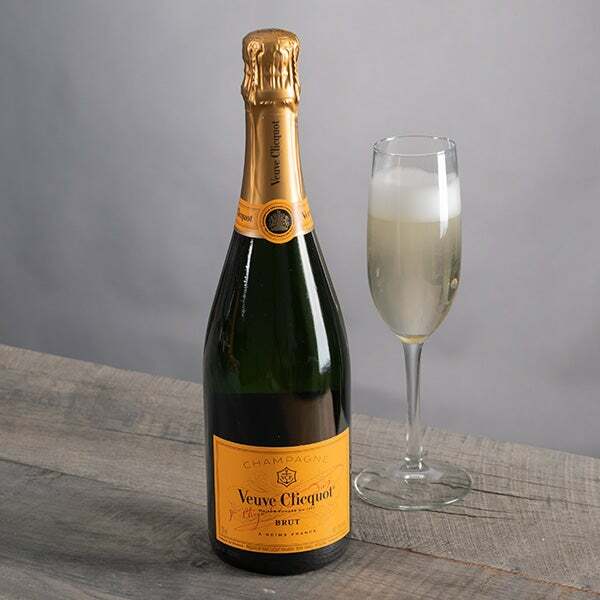 Rated 5 out of 5 by kwinger113 from Veuve Yellow Label Great gift for any occasion. One of our favorite champagnes. Rated 5 out of 5 by Quigz from This company gets it done! I needed several bottles of fine French Champagne delivered a long distance quickly. Most on-line wine sales sites have some difficulties shipping wine here or there.... confusing regulations, etc.. Gourmetgiftobasket took care of my speciality need immediately, got it delivered and performed the task in a terrific manner. Rated 4 out of 5 by Protag86 from Congratulations Gift I had ordered this gift for a friend that graduation the Fire Academy. I knew struggles he went through to make it to that milestone. Although I didn't physicallly see the bottle myself, the gift was well received. I texted me and said it was "fancy"so I guess that is a good thing. Rated 4 out of 5 by DeMa from Could have been 5 stars I bought this as a congratulatory gift for my niece's promotion. She loved it, and it's arrival made her day. This could have been a 5 star rating but for the way it was packaged. I thought it would at least be delivered in a pretty box. Instead, it came in a brown shipping box, surrounded by foam. I was kind of disappointed. It didn't seem to matter to my niece, but it mattered to me. 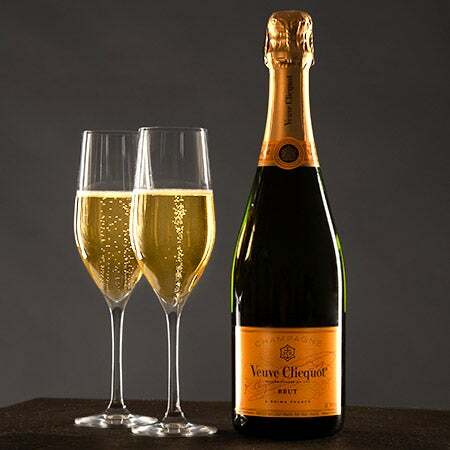 Veuve Cliquot Yellow Label is a crisp, golden-yellow champagne, and is comprised of fifty to sixty different Crus, including Pinot Noir, Pinot Meunier and Chardonnay. When you pour a glass of this fine champagne, you will notice not only the foaming necklace of tiny bubbles, but also the aromas of white fruits, raisins, vanilla and brioche. The first sip delivers all the freshness that you would come to expect from a glass of Yellow Label, with a flurry of fruit flavors overwhelming your palate. With its amazing taste and finish, Yellow Label is the perfect champagne to enjoy with any meal and makes for an unforgettable gift. 21+ Signature Required At Delivery. This product cannot be purchased using any discounts and/or promotional codes.